Package: Presonus Studio Channel Recording Tube Mic Pre-Amp Strip With Compressor And Equalizer Built In + Audio Technica ATH-M30X Professional Studio Monitor Collapsible Headphones. Condition: BRAND NEW IN ORIGINAL PACKAGING. (1) Presonus StudioChannel Studio Channel Recording Vacuum Tube Mic Preamp Strip. 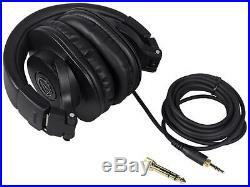 (1) Audio Technica ATH-M30X Professional Studio Monitor Collapsible Headphones. #1 Authorized Presonus Internet Dealer! Class A vacuum tube microphone / instrument preamplifier. Tube gain and tube drive. Variable VCA compressor (threshold, ratio, attack, release, make up gain, auto, soft). Precision analog VU meter for gain reduction and output. A professional channel strip combining Class A tube preamplifier, VCA-based compressor and three-band parametric equalizer perfect for the professional and project studio. Of microphones, instruments, keyboards and synths, the Studio Channel has the sonic power and flexibility to achieve any tone you can dream of - luscious in your face vocals. Clear acoustic guitars, fat solid bass guitar, dynamic acoustic piano, cracking snare, punchy bass, huge MPC tracks and more. The Studio Channel noticeably outperforms preamplifiers that are built-in to most recording interfaces and affordable mixers. Add a VCA-based compressor and studio-grade equalizer to the class A tube preamp and you get not only big fat tube tonality but also complete control of your tone and sounds. The compressor in the Studio Channel is a fully variable ultra-fast and smooth VCA-based circuit with all of the controls needed for a wide range of compression settings: ratio, threshold, attack, release and gain make up. The VCA-based compressor is known for musicality as well as ultra fast attack with the ability to tame the fastest transients. From slap bass, to snare drum, to vocals, the Studio Channel's compressor stage allows you to record as hot as needed without clipping giving you total dynamic control. The equalizer in the Studio Channel is like a Swiss Army pocket knife, with the ability to carve out unwanted frequencies as well as tailor your tone to enhance your sound. The custom-designed amplifiers in the EQ deliver sweet-sounding gain/cut for ultra smooth highs, deep solid lows and clear midrange. The mid-band of the EQ section has variable Q for controlling the width around the center point of the selected frequency. High and low frequency bands give you the option for selecting peak/dip or shelving frequencies. 10 Hz to 50 kHz. 0 dBu = 0 dB. 6 dB to +66 dB (+/- 10dB trim on line input). THD + Noise (0% Tube Drive). THD + Noise (100% Tube Drive). 3 dB at 80 Hz. 40 dBu to +2- dBu. 1-10 (1:1 to 2:1). 0.1 to 200 ms. 0.05 ms to 3 S. 10 dB to +10 dB. 0.7 (on'peak' setting). Variable from 200 Hz to 3 kHz. Variable from -10 dB to +10 dB. Variable from 0.7 to 2.5. Variable from 2 kHz to 20 kHz. 80 dB to +10 dB. XLR Balanced and ¼ TRS Balanced/Unbalanced. Analog VU (-20 dBu to +6 dBu). Analog VU -20 dB to 0 dB. 19" x 1.75" x 5.5. The M-Series ATH-M30x professional monitor headphones combine modern engineering and high-quality materials to deliver a comfortable listening experience, with enhanced audio clarity and sound isolation. Tuned for highly detailed audio, with strong mid-range definition, these versatile monitoring headphones are ideal in a variety of situations. Designed primarily for studio tracking and mixing, they offer added features for increased portability, making them a great choice for field recording. More About the M-Series Headphones. Critically acclaimed M-Series professional monitor headphones deliver accurate audio and outstanding comfort, perfect for long sessions in the studio and on the go. Contoured earcups seal tight for excellent sound isolation, with minimal bleed. And the pro-grade materials are durable, yet comfortable. Find out why online reviewers, top audio engineers, and cult followers agree, M-Series is an unmatched combination of audio and build-quality that gets the job done. Hour after hour, year after year. 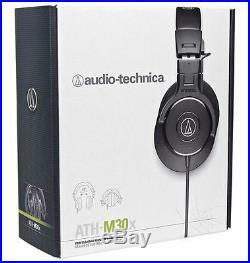 Audio Technica ATH-M30X Professional Studio Monitor Collapsible Headphones. Advanced build quality and engineering. 40 mm drivers with rare earth magnets and copper-clad aluminum wire voice coils. Tuned for enhanced detail, with excellent mid-range definition. Circumaural design contours around the ears for excellent sound isolation in loud environments. Designed to excel for studio tracking, mixing and field recording. Voice Coil: Copper-clad aluminum wire. Frequency Response: 15 - 22,000 Hz. Maximum Input Power: 1,300 mW at 1 kHz. Weight: 220 g (7.8 oz), without cable and connector. Cable: 3.0 m (9.8'), straight, left-side exit. 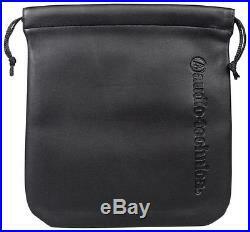 Accessories Included: Protective carrying pouch, 6.3 mm (1/4) screw-on adapter. Defective items: If your item is defective within the first 30 days of when it was delivered to you; you have the following options. We will send you a. To replace the item for a brand new one. Non-defective items: If you want to return your item within the first 30 days of when it was delivered to you; you have the following options. This includes blown speakers with burned voice coils. The item "Presonus Studio Channel Recording Vacuum Tube Mic Preamp Strip+Studio Headphones" is in sale since Wednesday, December 02, 2015. This item is in the category "Musical Instruments & Gear\Pro Audio Equipment\Audio/MIDI Interfaces". The seller is "audiosavings" and is located in Inwood, New York. This item can be shipped to United States, to Canada, to United Kingdom, to China, to Mexico, to Germany, to Japan, BR, to France, to Australia, RU, DK, RO, SK, BG, CZ, FI, HU, LV, LT, MT, EE, GR, PT, CY, SI, SE, KR, ID, to Taiwan, ZA, TH, to Belgium, to Hong Kong, to Ireland, to Netherlands, PL, to Spain, to Italy, to Austria, IL, to New Zealand, PH, SG, to Switzerland, NO, SA, UA, AE, QA, KW, BH, HR, MY, TR, CL, CO, CR, PA, TT.